Really–Just How Important is Your Given Name? In Act II, Scene II of Shakespeare's 1597 play, Romeo and Juliet, Juliet says in reference to Romeo's surname, Montague, that they should ignore his surname which is meaningless to them so they could be together. Map: Six Decades of the Most Popular Names for Girls, State-by-State I love infographics (graphic visual representations of information, data, or knowledge intended … Continue reading Really–Just How Important is Your Given Name? We Just Didn’t Make This Stuff Up…Or, Did We? Facebook Post on Origins of Expressions This morning my daughter shared a September 3, 2014, Facebook post created by Dan Steele (Dan Balam) of Norfolk, Virginia. His post was an easy and fun read that got me to questioning whether the origins of the terms and phrases actually had been proven true or were myths … Continue reading We Just Didn’t Make This Stuff Up…Or, Did We? Genetically Speaking, Could We Be Cousins? Hard to believe, but we just might be near or distant cousins or cousins once or more removed. When I started my genealogy research about 35 years ago we may never have been able to answer my question about being cousins with any certainty in a single lifetime. However, 11 years after my initial genealogical research, the … Continue reading Genetically Speaking, Could We Be Cousins? Massachusetts is one of several states that wants to keep penmanship lessons in the curriculum. 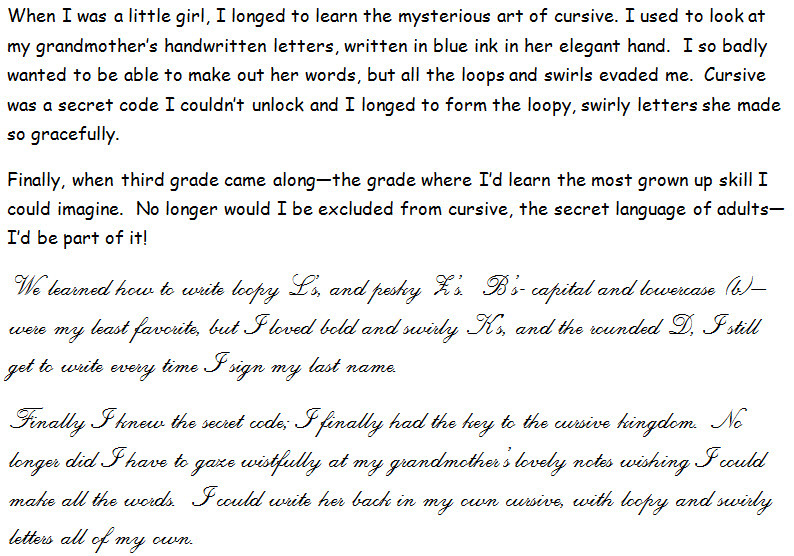 Do you think we should keep cursive writing alive? Sandy Schefkind, a pediatric occupational therapist in Bethesda, Md., and pediatric coordinator for the American Occupational Therapy Association, said that learning cursive helped students hone their fine motor skills.